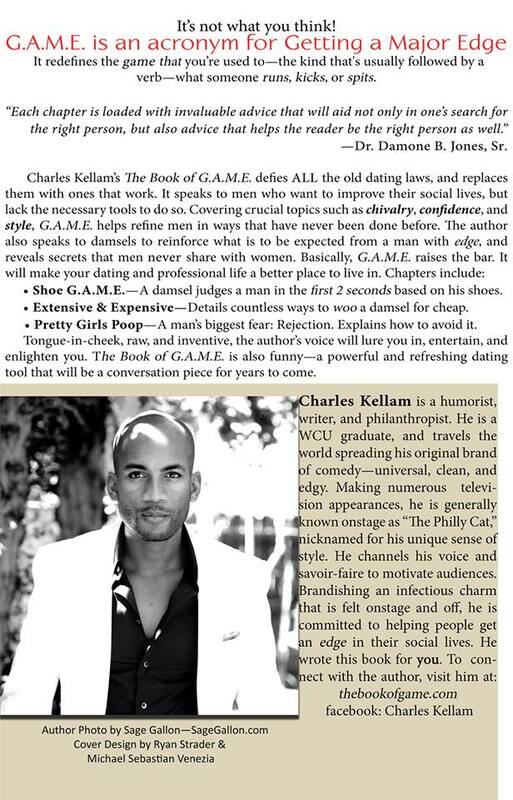 Charles Kellam’s “Book of G.A.M.E.” Available Xmas Eve! Tired of the same old relationship books that repeat the same tips and to-do’s? Well, here’s a book that should be refreshing (and a neat stocking stuffer)! The Book of G.A.M.E. was written by Charles Kellam (aka the Philly Cat), known for his success as a comedian, and he has taken on the challenge to help men out there Get A Major Edge. His new book will highlight ways to not just book a damsel, but how to actually redefine the dating laws you once thought were etched in stone. Be sure to snag Book of G.A.M.E. on Christmas Eve; you are in for a major treat! Wow, I’m so elated right now. And speechless. And grateful.